We’ve teamed up with ingenie, the young driver insurance brand, to offer the chance to win a brilliant new Vauxhall Corsa 1.4i 75PS ecoFLEX Energy 3dr worth £14,340! FirstCar is the multi-award winning, market-leading publisher for new drivers. We’ve teamed up ingenie the young driver insurance brand, to offer the chance to win a brilliant new Vauxhall Corsa 1.4i 75PS ecoFLEX Energy 3dr worth £14,340! Please note: You'll need to be over 17 or over at the time of the draw. For full terms and conditions, please click here. ingenie is a black box insurance company that is dedicated to making new drivers safer. They are this year's sponsor of the FirstCar win a car competition. You can find out more about Ingenie by visiting their website here. The lucky winner of the recent FirstCar ‘win a car’ competition was 17-year-old Rodney Ruvaro from Derby. Out of the 67,833 entrants who entered the competition over the past year, he was the randomly selected winner. 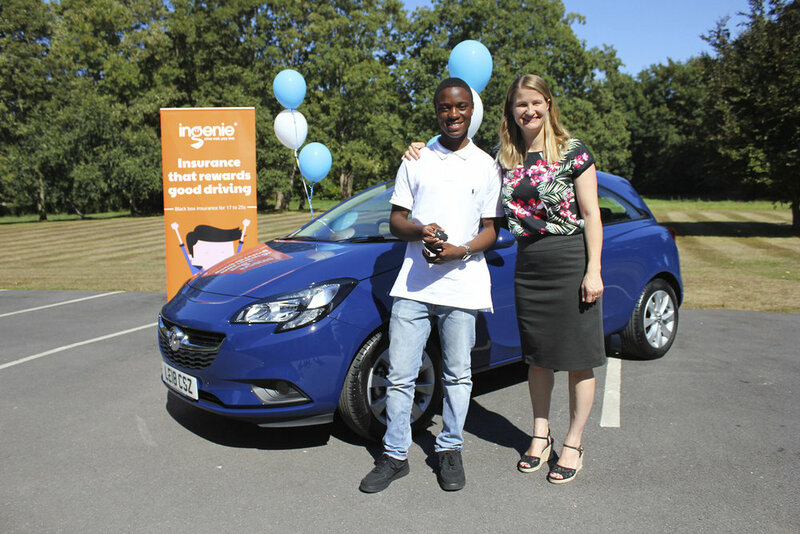 Rodney was handed the keys to his brand new Corsa on Thursday, 2nd August by Katey-Rose Gregory, Content and Social Media Manager at our competition sponsor, ingenie. A special thanks to our kind sponsors ingenie, the young driver insurance specialist, who as an added bonus also included an annual insurance policy, letting Rodney drive the Vauxhall Corsa 1.4i 75PS ecoFLEX Energy 3dr, worth £13,000, away on the day! The lucky winner of the recent FirstCar ‘win a car’ competition was 17-year-old Katie Lewis from Hillingdon, near Heathrow. Out of the 61,717 entrants who entered the competition over the past year, she was the randomly selected winner. Katie was handed the keys to her brand new Corsa on Friday, 18th August by Laura-Jane Pohlmann, Head of Marketing at our competition sponsor, ingenie. A special thanks to our kind sponsors ingenie, the young driver insurance specialist, who as an added bonus also included an annual insurance policy, letting her drive the Vauxhall Corsa 1.4i 75PS ecoFLEX Energy 3dr, worth £13,425, away with her mum. 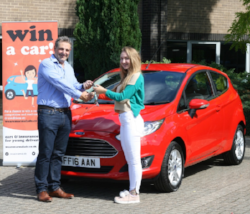 A 17 year-old student and learner driver from Cheltenham has won her dream car - a brand new Ford Fiesta - thanks to a competition run in young driver’s magazine First Car by Marmalade, leading provider of cars and telematics-based insurance for young drivers. Honor Bryce-Morris was randomly selected from over 96,000 competition entries. She couldn’t believe her luck when she was called and told she had been picked after having entered the competition earlier in the year. Lara, Honor’s mum, said: “The whole family is in disbelief at winning this car, we’re so grateful. Honor is a keen horse-rider and has to look after her horse twice a day. Having her own car once she gets her licence will make all our lives easier, giving her the independence she wants and needs, and letting Mum’s taxi service have a welcome break! 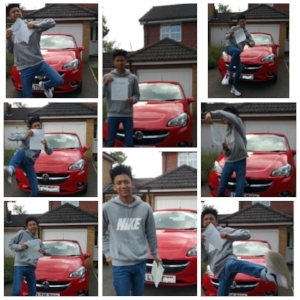 Some photos of the lucky winner of the Corsa from 2015. Brandon went on to pass his test in the car!